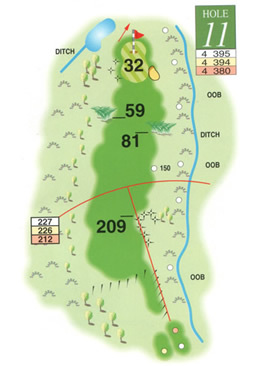 This is the course’s stroke index 1 hole with an elevated teeing area requiring a good strike left of centre thereby avoiding the out of bounds Cole Stream on the right. The prevailing wind makes the second shot a good test of medium and long iron play as once more there is little room for manoeuvre between the green and the out of bounds markers to the right and a pond to the left. There are also pampas grasses planted both right and left which can destroy a good score if brought into play. Once more the chasing iron down the middle can well take these hazards out of contention. The green is one of the longest on the course so a putt from one end to the other can prove difficult but the surface is good and true and putts well.